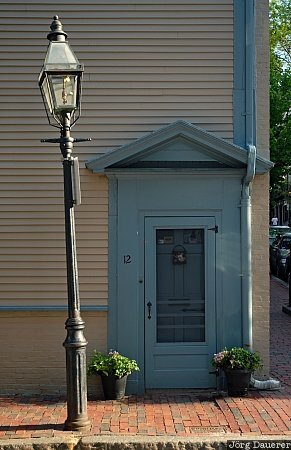 A blue door on a street on Beacon Hill with an askew street lamp in the front. Beacon Hill is in Boston, Massachusetts on the Atlantic coast of the United States. This photo was taken in the evening of a sunny day in May of 2010. This photo is part of the exhibition Doors (June 2010). This photo was taken with a digital camera.